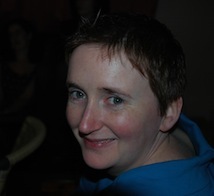 Karen Power is an Irish composer who writes primarily for acoustic and electroacoustic forces. Her initial interest in composition came during her undergraduate degree in University College Cork (UCC), where she familiarised herself with as many musical styles as were on offer while developing a compositional language with ‘post-minimalist’ influences. Recently Karen has spent time in residency at The Banff Centre, Canada, The Guesthouse, Ireland and was a composer fellow at UCDavis, California, USA. Karen has written pieces for Alarm Will Sound, SCAW, Carin Levine, the Ulster Orchestra, Kate Ellis, Mmm Trio and Quiet Music Ensemble. She has been awarded national and international awards and honorary mentions for her work and has represented Ireland internationally on a number of occasions. Karen’s compositional interests are constantly shifting, transforming and re-shaping, with current projects including a sound and movement collaborative work and a video and sound collaboration. Karen Power is an active member of the AIC (Association of Irish Composers) the SPNM (Society for the Promotion of New Music), the IAWM (International Alliance for Women in Music), SEAMUS (Society for Electro Acoustic Music in the US) and a founding member of the ICC (Irish Composer’s Collective).